A simple & clever tile laying game that brings new challenges with every turn. In Carcassonne, players develop an area around the city by placing land tiles. Each turn the area becomes larger as the players expand and add roads, fields, cities, and cloisters. 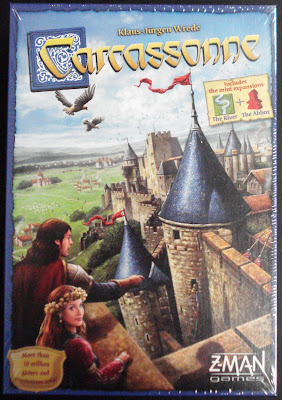 Players may also deploy their followers as thieves, farmers, knights, and monks to control and score points for the roads, farms, cities, and cloisters. 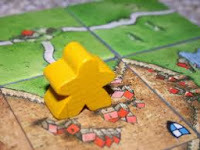 As the players have only a few followers; the wise player will plan his moves carefully and deploy followers when and where they can earn the most points. The game now includes the River and the Abbot mini expansions. The River gives you a new place to start. The Abbot brings gardens and provides for more scoring options.